Do you find yourself constantly busy or working longer and longer hours and not having enough time in each day to do what you want to do? It was certainly a feeling that I had. It seemed like no matter how hard I tried at work, I was always behind where I wanted to be and my hours were starting to stretch as a result. Add up how much time you spend on each of these and other obvious time wasters and you will be amazed at how much of your day goes on these things which you know are bad. Minimising office banter and conversation alone saved me ~1 hour every day. If you think that this makes the office 'more fun' just think about whether you'd rather office banter or an earlier time to leave the office...easy decision in my books. This book genuinely changed my life. I re-defined my goals, increased my productivity at work 300% and am now doing a lot more things that I love to do. I confess that I hadn't read the 4-Hour Workweek until recently because I had always assumed it was one of those 'get rich quick and have the perfect life with no effort' type of books that always seem to make the best seller list because it is selling a dream that is largely unachievable. A classic example of a book like this is Rich Dad Poor Dad (see my full review here). I only really read the 4-Hour Workweek because my business plans had stalled and my girlfriend mentioned that it was an incredibly good book. I promptly bought the book and hated the first few chapters. However I had promised her that I would read the book and actually complete the questions at the end of each chapter so I thought I would plod through it and then write a review about how much I hated it. Recently I have started to rearrange this blog to make it more reader friendly. I realised that I have close to 500 published posts and even within sub categories such as Investment Banking and Net Worth Posts it is getting pretty hard to navigate. As such I have been looking for ways to make this blog more accessible. My first real attempt at a blog was a (now defunct) finance book review blog. I imported most of those posts over to this blog a few years ago and I have been slowly building on it as time has gone one. I have added a Suggested Reading page (which is accessible through the top navigation bar) to make it easy to find out the books I recommend as well as the books I don't. I have linked to all the previous reviews I have done to make it easier to navigate through my reviews. What have you done to change the world recently...? If you are a reader of this blog the chances are that wealth creation, finance, investment banking, real estate or something else to do with money is what you are interested in. I am completely in that camp as well and working in finance and writing about finance all day long often has me wrapped up in a bubble that I rarely step outside of. I stop thinking about capital generation, wealth preservation and the enjoyment of life that comes from that (i.e. holidays, a nice apartment, dinners etc) and start thinking about other things in the world around me. Invariably this takes me down two paths: I either think about politics or I think about charity. When I think about politics I almost always end up depressed and disenchanted. The people with the most ability to affect change in our world seem focused on their own goals and interests and caught up in their own 'bubble'. This is not always true and occasionally you'll see something really great come out of politicians. But for the most part we seem to be disappointed with the lack of progress that we desire. When I was a bit younger I confess that communicating about money was the last thing I did in a relationship. It didn't feel like one of the important things you needed to focus on. It was not that I was 'the shallow guy' - looks weren't the things I focused on - I focused on how nice the girl was, how she treated me and how she treated others (you know those soft things you're told that you should focus on) but I never really talked about money. As I'm getting closer to proposing to my girlfriend and settling down and getting married and all the expenses that come with that I have started communicating more...and I've realised just how important it is to get on the same page. It's not that my girlfriend and I had vastly different expectations about our financial life - to the contrary - we were more alike than I first imagined but communicating allows you to to work together towards your financial future. Some of the advice below I have muddled my way through and worked it out on my own while others is a compilation of advice from my older (and wiser) couples who have a great working relationship when it comes to finances. Why is communicating about money important? Communication and compromise is the key - work out what you're willing to compromise on and make it work. There are many more reasons that talking about money is important but the ones above are the ones that really stood out to me. If the older (and more experienced) readers of this blog would be willing to add more advice for the less experienced readers (like myself) that would be much appreciated! ...But how do I bring up the topic of money with my partner? One of the best things about writing a blog is that I get to share some of the information that I have gathered over the years which may be of use to other people. One of the very few problems that I've come across as my blog has gotten on is how to organise and order the information on this blog - as of April 2014 this blog had more than 450 posts. One of the most popular areas of this blog, as evidenced by the page views as well as the number of emails I receive on the topic, is the section on Investment Banking. My stint (for 3 years) as an analyst in an investment bank was incredibly revealing and I have a lot to share on the topic. Recently when I was trying to avoid actually doing work I was wasting a fair bit of time on Facebook. I have a strangely diverse group of friends on Facebook some of whom are right wing and some of whom are very left wing and it is always interesting to see the articles that people are sharing. Recently one of the more right wing people put up a video from a US talk show (I think it was on Fox News) where they were espousing the view that in a fair and equitable society that we should all have equality of opportunity and that equality of outcome is actually inequitable because it does not reward effort and hard work. I have to admit that at one basic level this is an incredibly tempting point of view - who of us has not hated paying taxes, especially when we see how some of it is wasted? Especially when we see people mooching of the system and then wanting to tax us more even though we are working stupidly long hours and not really getting to where we want to get to. The problem with the 'equality of opportunity' mantra that is often spouted by right wing pundits is that if you were truly interested in the 'fairness' of the system and making hard work and effort the primary determiner of outcomes and success you would be most interested in making sure that people started at the same point. People start at different points and have different advantages and disadvantages due to not fault or skill of their own. If you live in a first world country you already have so many advantages that others around the world do not have. Then if you are lucky enough to be within a social structure that allows you all the possible opportunities you are most able to make your effort count. Regular readers may have noticed that I have not written about investing in property for a while. This is because once the initial work is done the amount of effort it takes to manage your property is largely a function of how involved you want to be. I want as little involvement as possible and this is the way that it has panned out. However, even if you are a low involvement landlord, one thing you will need to think about is when and if to raise the rent. In a previous post I wrote about how you should keep on top of your contract renewals. One of the main reasons that you want to do this is that it provides an opportune moment to review what your tenants are paying and consider increasing the rent. The process for setting the rent at this point should be pretty similar to when you first got the tenants into the property. However make sure you take advice from your agent. Your agent will often tell you whether you can increase your rent and if so by how much. Sometimes, if the market is particularly soft, the agent may advise you against increasing your rent at all. It is a reasonably tough rental market in Melbourne for landlords. For the last few years, every time I've had a contract renewal come up the agent has advised me to keep my rent flat, and given the circumstances I have agreed. Note that I haven't done this blindly - when I moved out of home I saw how easy it was to negotiate better rent with landlords or for repairs and work that they would not normally do. However sometimes you have to back your own judgement. I hadn't raised the rent on my investment property in 3 years. In this time I have had the same tenants and I have largely agreed to all the maintenance (albeit minor) that they have requested. I have also agreed to their request to have a pet. I like them and they seem to maintain the property well. It is a good relationship but it is not a charitable one. After doing my own search on the internet I found that, although my property is not under-rented, it is certainly not far ahead of the market. As you can probably guess from this website - I am a person who likes tracking everything. I track my financial goals, I track my weight, I track my savings, I track my expenses. It was therefore rather disconcerting when I found myself wanting to write a post on my 2013 share portfolio return and I was unable to dissect what it actually was. All of these challenges are surmountable however if you try and do it in hindsight it is close to impossible. I tried to do it for 2013 so I could write a post on my 2013 portfolio return and after a day of effort I realised that it was just far too much effort. If you want to track your portfolio returns therefore, you need to set up a method of doing so at the start of your tracking period which takes into account all of the issues above. Whose priorities matter when corporations donate large amounts of cash? Yesterday Westpac Banking Corporation (ASX: WBC) announced that it was donating $100 million towards setting up an IT educational scholarship which addresses the lack of females in the IT industry [Edit: The focus of the foundation appears to be much more broad than the news reports originally suggested - I actually support much of what they are doing personally but my comments about the agency problem identified in this article still stand]. As you can see from the attached article, the press loves feel good stories like this and it is almost reputational suicide to publicly stand against a move. However I am against the very concept of donations such as this. This is not because I am against donating to charity - indeed I support several charities and micro finance organisations including The Cancer Council, Kiva, Catholic Mission and the Fred Hollows Foundation. I think charitable donations are a great way to benefit society and save tax at the same time. The board and management team of a corporation are charged with acting in the best interests of their stakeholders. Although some define the stakeholders quite narrowly - i.e. only shareholders - I have a more broad view and believe that corporations should act in the best interests of all of their stakeholders - i.e. shareholders, employees and customers. Therefore, unless an action is in the best interests of the stakeholders of the company - i.e. the shareholders, employees or customers then it is not their role to donate this cash. Some people make the compelling argument that corporations are the only actors which can bring enough clout to an issue to make a difference. In the modern world they control the largest pools of capital and these pools of capital can be brought to bear in a way that makes a difference. Whilst this is true there is a massive agency problem that happens - in this world of limited resources and unlimited problems, who determines where the corporations donate their shareholders' cash. March is always a bit of a painful month for me - there are always numerous birthdays and anniversaries, it is normally the last gasp of summer so I'm trying to get out and do all the things I forgot to do over the summer and this year I have a lot of weddings and bucks nights which seemed to fall during this time as well. Last year was similar. That being said - it was not a complete disaster. In February I managed to stick to my expenditure targets quite well so I had plenty of cash available for savings in March. Last month I had mentioned that I got real value out of tracking my expenditure at a much more granular level - I could see what I was spending a lot of my money on and where I could save cash (and also where I was underspending compared to what I wanted to do). I am still getting a lot of this value but I've got to say that keeping up with the allocation of every dollar spent in my spreadsheet is turning out to be a bit of a headache. It is not really difficult but it is tedious and unless you're really committed to knowing what is going on with your finances I recommend finding an easier way to do this. I'll probably stick with this methodology for the rest of the year but I'm definitely changing it next year. Below you can see my detailed expenditure tracker for this month and the causes of the movements in individual accounts. I expected this month to be another negative net worth performance after several of my share market trades went against me however it actually turned into quite a good result because I saved a significant amount of my wage. 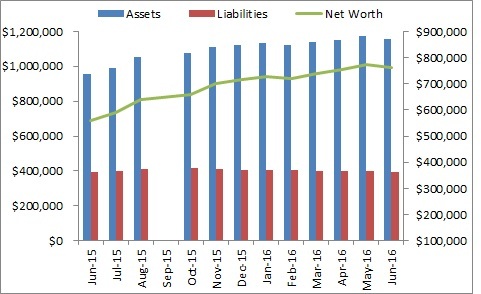 In recent months the share market has driven my net worth performance far more than any effort I could muster on the savings front however this month was much more 'normal' if somewhat under-whelming. I had targeted a net worth of $490,000 for this month and although it was somewhat disappointing not to have gotten to this mark, month to month movements are not what I am particularly focused on. I still think that $500,000 by the end of the financial year (June 2014) is achievable however the $550,000 goal I had set last year is definitely out of my reach now.